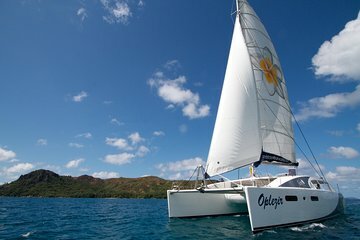 Climb aboard a spacious catamaran for this full-day sailing tour in the Seychelles. Imagine you are explorer Robinson Crusoe, stopping at St. Pierre Island for swimming and snorkeling, then visiting the Curieuse Island Reserve to see the giant tortoises and embark on a walking tour to Anse Josee. You'll also enjoy a barbecue lunch on board before final stops at Anse Georgette and a cruise by Praslin Island.